Preheat oven to 375°F. Open and unroll pizza dough. Use a small cup or biscuit cutter to cut dough into twelve 2 1/2 inch rounds. Press each round into one of cup of a non-stick mini muffin tin. Spoon pizza sauce into each cup, sprinkle with a bit of cheese, then gently press a meatball into each cup. Finish baking, another 5-10 minutes, or just until the edges of the dough are golden brown. Remove and cool slightly before removing from muffin tin. Top with a spoonful of sauce and fresh basil before serving. Enjoy! Eatzza pizza miracle! Meatballs baked in cheesy sauce and hot, fresh dough for the simplest take on pizza bites yet. Everybody loves pizza. I can't think of a single recipe that has seen more variations, more passionate debate on favorites, more Friday nights of sheer deliciousness than the humble pizza. And now, we make it easier than ever to eatzza pizza! 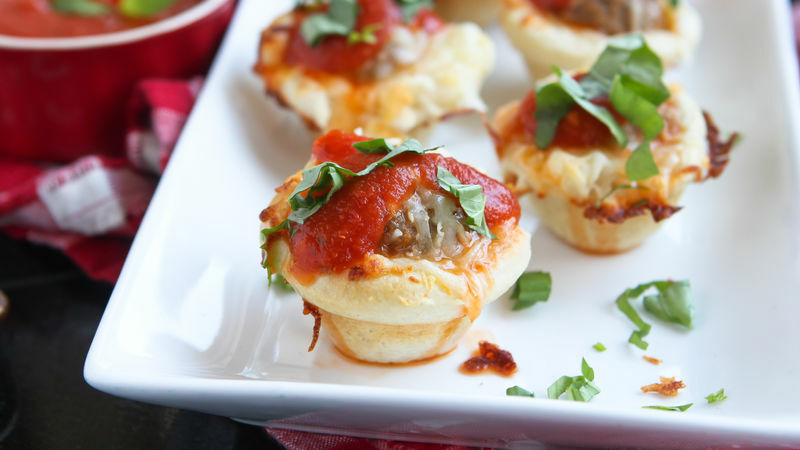 These Meatball Pizza Cups require very little prep (use frozen meatballs...yes! ), look adorable when baked, and taste like….ahhh….pizza perfection! Here's all you need to get these piping little hot bites of pizza right onto your party table in minutes! Now, check it. Life gets even easier once you start prepping. Who can say that? Cooking is the EASY part? Why, yes, you. This is life, dialed down to vacation cooking mode. You'll need a muffin tin and a hammock. Once those babies are baked, take them right out of the oven and gently tug them from their little muffin cups. They should release without any sticking. Simple and nearly ready to serve! A quick schmitz of pizza sauce up top, a fresh smattering of basil, and you've got little Meatball Pizzas that are ready to be enjoyed immediately. Life with pizza. But two-bite-sized. It's a happy thing.